During your onboarding, Zentail can identify which merchant fulfilled SKUs match with which FBA SKUs on your Amazon account. This process allows you to manage them as a single product with two sets of inventory in Zentail, instead of as two separate products. Once you're on Zentail, any new SKU will automatically be created with a +MF+ SKU that represents your merchant fulfilled listing. This allows you to use merged SKUs without creating two new SKUs in Zentail every time. You'll see them on your Amazon account, but not in Zentail. Let's say you sell a hat and call it SKU-A. SKU-A has 10 units of inventory in FBA, and 5 in your merchant fulfilled warehouse. The chart below shows how you would need to manage the inventory of SKU-A in Zentail without merged SKUs (this assumes FBA MCF is enabled). Both SKU-A in your Amazon warehouse, and SKU-A-MF in your Merchant Fulfilled warehouse would be listed separately. In this slightly-less-than ideal configuration, if you wanted to edit the product description from "Great Hat" to "Best Hat" you would have to edit the description for SKU-A, then also edit the description for SKU-A-MF. And now if you wanted to edit the description from "Great Hat" to "Best Hat" you would only need to edit the description for SKU-A, and both Amazon listings would get the update. Notice that if you have FBA disabled for Walmart, Zentail will still send only the merchant fulfilled inventory, not the FBA inventory. When we merge SKUs the FBA SKU will be the SKU that you see in your account as the surviving SKU. The merchant fulfilled SKU will still exist in Zentail; it's just been moved to the archive. It likes being archived, and unarchiving it will make it unhappy. Once SKUs are merged, only the surviving SKU should be active, and all edits should be made only to the surviving SKU. You can either make both FBA and MF inventory available at the same time on Amazon, or you can enable the auto-flip FBA to MF. This sends zero MF inventory until you ran out of FBA inventory, then makes your MF inventory available. Some sellers like to analyze sales on merchant fulfilled and FBA SKUs separately. That's totally fine! 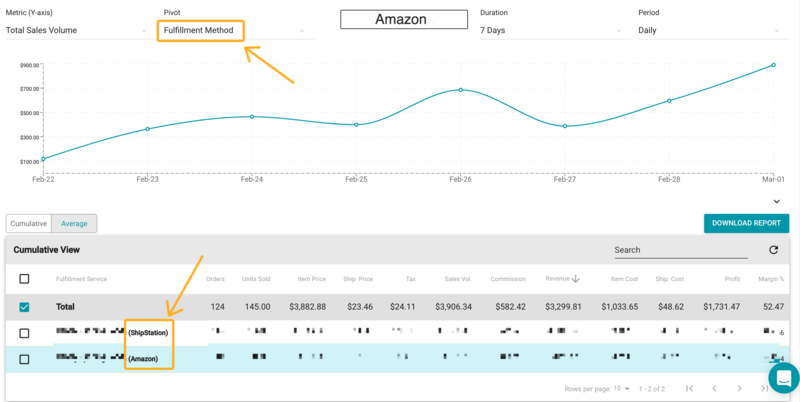 You can either do an orders export and compare FBA warehouse orders to non-FBA, or use the filters in the analytics view. If an Amazon order is placed for an FBA SKU it will be mapped to FBA no matter what. This ensures that your listing complies with FBA terms. An order placed for one of those 15 units on eBay would follow the routing preferences on your account settings page. FBA inventory would be updated automatically, and any MF inventory will just be edited for SKU-A in the MF warehouse.